New "English votes for English laws" rules have been implemented in the House of Commons for the first time. Conservative MPs cheered as English and Welsh members prepared to give their consent to parts of the Housing and Planning Bill that only apply to their constituencies. Housing Minister Brandon Lewis said he was "very proud" to be implementing the reforms. But the SNP said the changes were "driving Scotland out of the door". They were introduced in response to calls for a stronger voice for English MPs following increased devolution to Scotland. Where parts of a bill are deemed to only affect England, or England and Wales, a new stage is added to the usual law-making process at which only MPs for English - or English and Welsh - constituencies can vote. Following the end of the Housing Bill's report stage, Speaker John Bercow suspended the sitting of the Commons for five minutes before finalising which provisions applied to which nations. 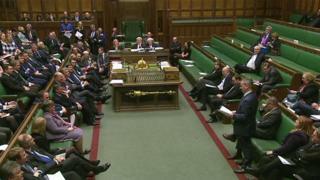 After MPs debated the new rules - MPs representing Scottish constituencies were entitled to speak but not to vote - the "consent motion" for England and Wales was agreed without a division. The Housing Bill, which includes an extension of the right-to-buy for housing association tenants in England, was later approved by all MPs at third reading stage.